New Delhi, Feb 4 : The Vision Document 2015 released by the BJP on Tuesday ahead of the Saturday elections in Delhi has called the people from the Northeast immigrants, raising heckles from the opposition Congress and others. 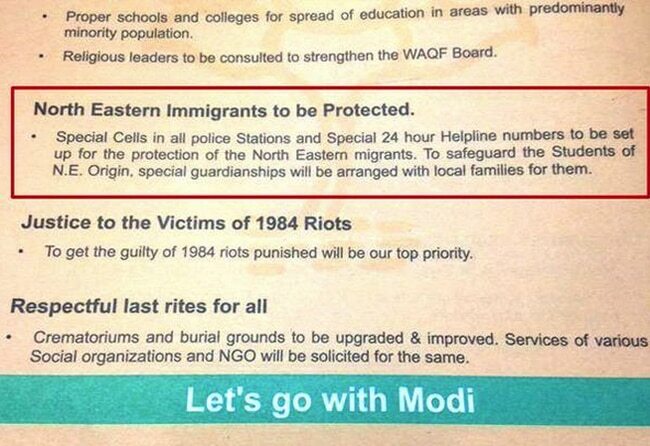 On page 14 of the document, which replaces a manifesto, it says under the heading 'North Eastern Immigrants to be Protected': "Special cells in all police stations and special 24-hour helpline numbers to be set up for the protection of the NorthEastern migrants. To safeguard the Students of NE origin, special guardianship will be arranged with local families for them." The Congress was quick to react with its chief ministerial candidate Ajay Maken asking, "Does the BJP consider them to be from some other country?" Maken said the BJP should remove the line from its document. 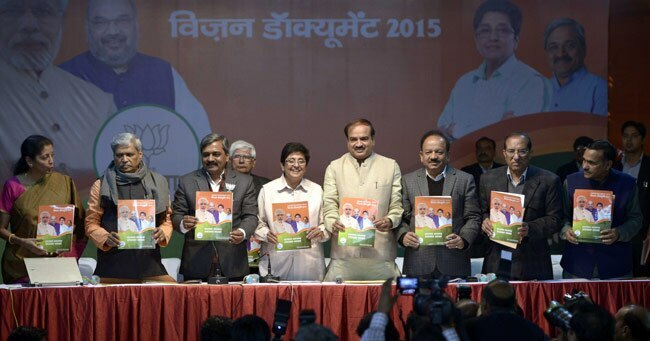 A grab of BJP's Vision Document 2015. The national capital has seen a series of racial attacks targeted at the people from the Northeast. Last year, the death of Nido Tania, a student from Arunachal Pradesh, after being beaten by shopkeepers in a South Delhi market, triggered massive protests. Several such incidents are reported every year. Many took to Twitter to express their outrage over the faux pa. Sanjivee ? @sanjivee said, "First they hide Kiren Rejiju from foreign dignitaries and now in their vision document they term North East Indians as "Immigrants". #fail." "Shocking that during release of Vision Doc, citizens of NE India are called immigrants. Now you know why they are alienated from you! #Shame," Ramesh Sharma said.